The main idol of Vadakkunnathan is always covered in clarified butter(ghee) there is an interesting epic related to this tradition.The legend is related to Arjuna. Arjuna was doing a hard penance to please Shiva and obtain special. Even after hard penance for years, Shiva did not manifest in front of Arjuna. Goddess Parvathy, the consort of Lord Shiva was curious to know why Shiva had not pleased yet. Shiva told Parvathy that Arjuna lacks the humility to have the divine weapons. To test him Shiva took the form of "Kirata" or a wild tribal and Goddess Parvathy as his wife - a tribal lady. During this time, Duryodhana the arch enemy of Arjuna sent a demon named Mookasura to interrupt the penance of Arjuna. Mookasura took the form of a wild boar and charged at Arjuna. Seeing this Shiva in the tribal disguise shot an arrow at the demon to save Arjuna. However Arjuna also shot the arrow at the same time. A proud Arjuna was not ready to accept that a mere tribal man helped him. So an argument ensued between Arjuna and the tribal man(Shiva). A fight followed and even lord Shiva couldn't match the skill of Arjuna and soon Shiva was fatally wounded, seeing this Parvathy Devi cursed Arjuna that all the arrows he shot became flowers before hitting Shiva. Arjuna finally realized that it is the divine couple in disguise and prayed for forgiveness. Shiva was happy and presented him with the famous "Pashupath Asthram" or a magical arrow. However, Shiva who suffered fatal wounds needed to have a therapy of clarified butter to heal his wounds. 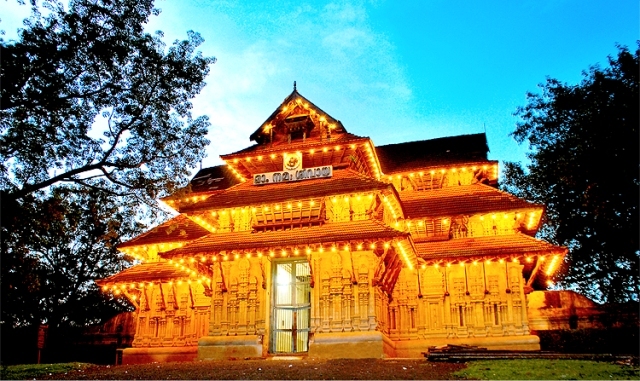 This is the legend behind the idol of Vadakkunnathan temple is covered in Ghee or clarified butter.